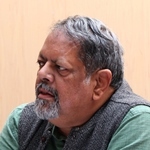 Sundar is a former advisor for the Society for Promotion of Area Resource Centres (SPARC). He is working on ESID’s urban poverty project, focusing on the Jawaharlal Nehru National Urban Renewal Mission (JNNURM) project in India. Sundar is a former IAS officer. He is also interested in the residential, occupational and social vulnerabilities of the urban poor. Watch Sundar discussing the importance of academic research for NGOs. Sundar Burra explains why academic research is important for NGOs from BWPI on Vimeo.